In a city as big as Atlanta, summer activities are varied and endless. Whether you want to have big fun on a small budget, take advantage of seasonal savings or play tourist at our most classic attractions, Atlanta has something for everyone. Through all the fun and excitement of the city, one summer scene always seems to make it on everyone’s to-do list – swimming. There are a dozen public pools in the city of Atlanta (plus more in the suburbs and a handful of hotel pools open to the public) and we’ve given you the run down of each one. Click through the slideshow to see which locations, admission fees and extra offerings are best for you and your family. Want more exciting water experiences? We’ve outlined plenty of ways to stay cool this summer! Don’t miss our guides to Atlanta’s water parks and aquatic centers and top spray grounds. If you want to soak up the sun while appreciating nature’s beauty, check out our overview on Atlanta area lakes and tubing down the Chattahoochee River. Story by Tiffany Jaquins. The Atlanta expert for About Travel, Kate Parham Kordsmeier, can be reached on twitter @KPKords or via email at kpkords@gmail.com. Don't forget to like us on Facebook and follow us on Twitter and Pinterest. Admission: $4 for adults and $2 for children up to age 16. Children under five swim for free. Unlimited entry passes are available for avid pool guests and can be purchased for individuals and families. A single household costs $245 for city of Atlanta residents and $470 for non-residents. Hours: The Grant Park Pool is open from late May to early August each year. Free swim is from 12:30 p.m. to 4:00 p.m. Monday through Friday. Paid swimming during the week is from 4:30 p.m. to 8:00 p.m. Paid weekend swimming is from 12:30 p.m. to 8:00 p.m. Adult-only lap swimming is from 7:00 a.m. to 9:00 a.m. every Monday, Wednesday and Friday. Overview: Don’t miss out on the zero-entry kiddie splash pool, swim team and swim lessons with champion swimmer Sabir Muhammad. Admission: $4 for adults and $4 for children ages 12 and under. Hours: Free swim is from 10:30 a.m. to 1:15 p.m. Monday through Friday. Paid swimming during the week is from 1:15 p.m. to 4:45 p.m. Paid swimming is from 12:30 p.m. to 4:45 p.m. on the weekends. Overview: Located in the heart of Buckhead, Garden Hills Pool is a family-centric public pool offering swim and dive teams for children and an adults-only Cool Sharks team. Grill out on the pool’s deck, complete with picnic tables that can be reserved in advance, while the kids run around on the Garden Hills play field. Be sure to check the pool’s website regularly for special events, like 21+ parties for adults, and membership availability. Admission: Adults pay $4, kids up to 16 pay $2 and children five and under cost $1. Hours: Free swim is from 10:00 a.m. to 12:30 p.m. Monday through Friday. Paid swimming during the week is from 12:30 p.m. to 5:00 p.m. Paid swimming during the weekend is from 10:30 a.m. to 5:00 p.m.
Overview: Chastain Park Pool is part of the Chastain Park Athletic Club. 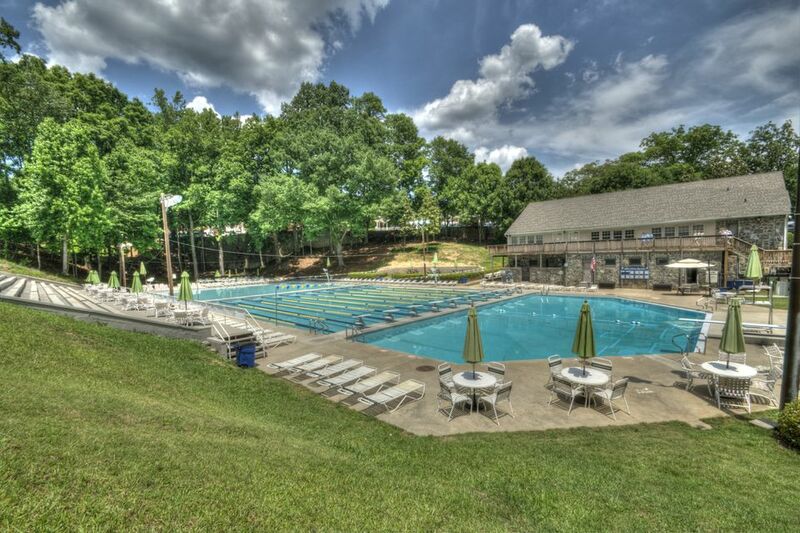 Not only can kids participate in the Chastain Park Tidal Waves swim team throughout the summer, but swim lessons are offered for both children and adults in packages of 3, 6 or 9 classes. Don’t miss out on special events at the pool, such as the Kids for Kids Charity Swim Meet where parents can join in on the fun and participate with their kids. Admission: Adults cost $4, kids up to age 16 cost $2 and children five and under swim for free. Hours: Candler Park Poo is open from the end of May to the beginning of September each year. Free swim is from 12:30 p.m. to 4:00 p.m. Monday through Friday. Paid swimming during the week is from 4:30 p.m. to 7:00 p.m. Paid swimming during the weekend is from 12:30 p.m. to 7:00 p.m.
Overview: Spend your summer days swimming in the middle of one of Atlanta’s most loved parks. Candler Park Pool offers swim lessons throughout the summer season, plus the pool hosts different activities throughout the season, such as a Senior (55+) free swim and Candler Park Water Ballet team practice from 11:00 a.m. to 12:00 p.m. on Thursdays. Be sure to arrive early and grab a lounge chair for sunbathing, as they are available on a first come first serve basis. Hours: The pool is closed on Sundays and Mondays. Normal pool hours are Tuesday through Saturday from 12:30 p.m. to 7:00 p.m. Free swim hours are from 12:30 p.m. to 4:00 p.m.
Overview: Although Anderson Park Pool does not offer swim lessons, their pool is open for plenty of summer fun. Pack your coolers--guests are allowed to bring their own food and drink to the park. Lounge chairs are available on a first come, first serve basis, or you can bring your own, plus floats and swim toys to use in the water. Hours: The pool is closed from Sunday to Monday. Normal pool hours are Tuesday through Saturday from 12:30 p.m. to 7:00 p.m. Free swim hours are from 12:30 p.m. to 4:00 p.m.
Overview: Dunbar Park Pool is the perfect place to enjoy a day of swimming with the family. You can bring your own lounge chairs, picnic blankets and coolers for enjoying lunch by the water. Bring along floats and swim toys to make the pool even more fun. Just remember that if the deck is highly crowded, a lifeguard might ask you to not use the toys until the crowd subsides. Swim lessons can also be set up with lifeguards from the pool. The best time to do this is outside of free swim hours, as the pool will not be as crowded. Hours: The pool, which is open from late May to early September each year, is closed Mondays and Tuesdays. The pool is open from 12:30 p.m. to 7:00 p.m. Wednesday through Sunday. Free swim hours are from 12:30 p.m. to 4:00 p.m.
Overview: From 10:00 a.m. to 11:00 a.m. on Wednesdays and Thursdays, Powell Park Pool is one of two City of Atlanta pools with a free swim time for seniors 55 and older. The pool also provides a simple space for having family fun. Lifeguards must approve floatation devices before being used in the pool. Although there are no pre-set swim lessons available, you can set up individual lessons with any of the lifeguards at the pool. Hours: From late May to early September every year, the pool is open for swimming Monday through Sunday from 12:30 p.m. to 7:00 p.m. Free swim hours are from 12:30 p.m. to 4:00 p.m.
Overview: Along with a designated lap swimming area, there is a handicapped chair lift at the Pittman Park Pool. Concessions are not sold at the pool, so stock up your coolers for enjoying lunch during swim breaks. Check with lifeguards to see if your child’s floats and swim toys are able to be used during high capacity hours. Overview: Along with Powell Park Pool, Southbend Park Pool is the only other city of Atlanta pool offering free swim hours for seniors ages 55 and older (from 10:00 a.m. to 11:00 a.m. every Wednesday and Friday). Benches are available to use while your kids are in the water, so be sure to bring a lounge chair if you want to sunbathe. Swim lessons are can be set up with the pool’s lifeguards. The cost and schedule of lessons will be based on their individual availability. Hours: The pool at Thomasville Park is open from late May to early September each year. The pool is closed from Sunday to Monday. Normal pool hours are Tuesday through Saturday from 12:30 p.m. to 7:00 p.m. Free swim hours are from 12:30 p.m. to 4:00 p.m. Note: when Atlanta City Schools start back, the hours of the pool will change. Overview: Call ahead to set up lanes for lap swimming and bring a lounge chair to use when the benches on the pool deck fill up. Although coolers are not allowed on the pool deck, you can leave them in the car to enjoy a picnic lunch in the park after you swim. For handicapped swimmers, there is a chair lift available to be used. Admission: City of Decatur residents pay $3 for adults, $2 for kids 2-17 and kids one and younger are free. Non-residents pay $5 (adults), $3 (2-17) and $3 (1 and younger). Hours: This pool is open from the end of May to the beginning of September each year. Public swimming is from 12:00 p.m. to 5:00 p.m. Monday through Friday. Laps-only swimming hours are from 10:00 a.m. to 12:00 p.m. every Tuesday and Thursday. Weekend hours are 10:00 a.m. to 6:00 p.m.
Overview: Home to the Decatur Gators swim team, Ebster Park Pool is the newest of Decatur’s three public pools and is also the only one with a diving board and splash pad. Swim lessons are available in the mornings, and you can call the pool for more information on times, availability and tuition. For adults seeking a calm exercise environment, adult lap swim is held every morning from 9:00 a.m. to 10:00 a.m. Hours: Public swimming is from 10:00 a.m. to 8:00 p.m. Monday through Friday. Weekend hours are 10:00 a.m. to 6:00 p.m.
Overview: Although it is the smallest of Decatur’s public pools, McKoy Pool is one of the most popular. With a beach entry, the pool is easy to access for younger children, seniors and handicapped swimmers. There are splash fountains in the more shallow areas of the pool and a dedicated area for swimming laps. These lanes can be scheduled for adult-only swimming. Lounge chairs are available for use, but they are first come, first serve. Consider bringing a picnic blanket or chairs of your own if you can't get there early. Overview: With designated snack areas, a spacious patio with lounge chairs, large shade cover and shallow water perfect for younger swimmers, Glenlake Pool is a perfect haven from the summer heat. Because Glenlake Pool is the largest of all the public pools in Decatur, it tends to be the busiest. Try visiting after 6:00 p.m. Monday through Friday after the pre-dinner rush for a more relaxed and less crowded time in the water. Admission: To gain access to their rooftop pool, you must purchase a SUNDAZE pass for $25. The pass includes admission, a $25 Food & Beverage credit and Valet Parking. Overview: Stay cool this summer with SUNDAZE's pool party, where you can sip signature cocktails (the strawberry mojito is our favorite) at the WET bar (you can also order lunch here), relax in the rooftop infinity pool and boogie down with Sunday jam-sessions with live DJs. Admission: There is no cost to use the pool. Cabanas can be rented for a four hour time slot for $175 or for an entire day for $300. Hours: The pool is open from 9:00 a.m. to 9:00 p.m. daily, and the WET pool bar is open from 11:00 a.m. to 8:00 p.m. on Friday through Sunday. The pool is closed to non-hotel guests on Saturdays. Overview: Relax and rejuvenate at one of Atlanta’s chicest hotels. Not only will you enjoy unmatchable views of the Atlanta skyline, but lounge chairs, towel service and outdoor showers are also available. We recommend renting a luxe private cabana that includes 4 large SmartWaters, sunscreen, W coozies, magazines, snacks and a flatscreen TV. Admission: Ticket prices range from $10 to $25 with each event. Hours: Open to the public for special events on Saturdays and Sundays. Check the pool’s list of special events for specific event hours. Overview: Escape the summer heat in style at the W Atlanta – Downtown’s WETBAR. Atlanta’s only all-weather rooftop bar offers special events for hotel guests and members of the public alike. Make a reservation for you and your friends to lounge on the sleek pool patio, sip on signature WETBAR cocktails and soak up one of the best views of the city while listening to the weekend DJ. Admission: Adults cost $4.50 and children ages 2-17 cost $3.50. Admission: City of Roswell residents cost $3, and non-residents cost $4.50. Children under the age of two swim for free.